"An inconvenience is only an adventure wrongly considered; an adventure is an inconvenience rightly considered"
"The more hopeless is the situation the more hopeful must be the man"
"The reasonable man adapts himself to the world; the unreasonable one persists in trying to adapt the world to himself. Therefore, all progress depends on the unreasonable man"
"You see things; and you say, 'Why?' But I dream things that never were; and I say, "Why not?"" 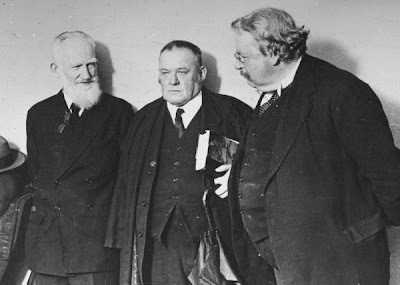 Chesterton was a large man, standing 1.93 meters and weighing around 134 kilograms. His girth gave rise to a famous anecdote. On a meeting occasion he remarked to his friendly enemy George Bernard Shaw: 'To look at you, anyone would think there was a famine in England.' Shaw retorted: 'To look at you, anyone would think you caused it"